Rhodium-catalyzed 1,4-addition of organoboron reagents involves the addition of nucleophilic aryl-, heteroaryl-, or alkenylboron reagents to electron-deficient alkenes. Several classes of chiral ligands are effective in enantioselective variants of the reaction. 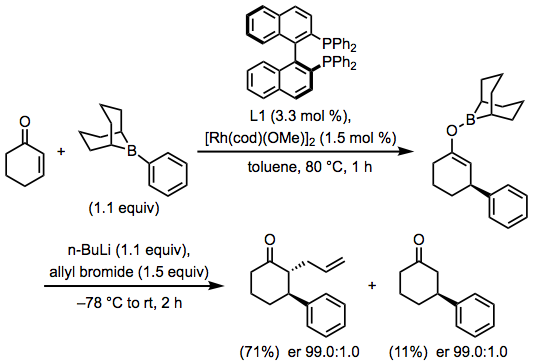 Within the broader field of enantioselective 1,4-additions of organometallic reagents to electron-deficient alkenes, rhodium-catalyzed 1,4-addition of organoboron reagents stands out for several reasons. Organoboron reagents are often readily available, stable, and tolerant of a variety of functional groups. The wide scope of electrophiles in these reactions includes unsaturated ketones, aldehydes, and carboxylic acid derivatives, nitroalkenes, alkenylphosphonates and -sulfonates, alkenylazaarenes, and electron-poor alkenylarenes. Reactions are usually insensitive to air and moisture and carried out under very mild conditions. Finally, many different families of chiral ligands (including both bidentate and monodentate ligands) may be employed to induce high enantioselectivities in these reactions (Eq. 1). 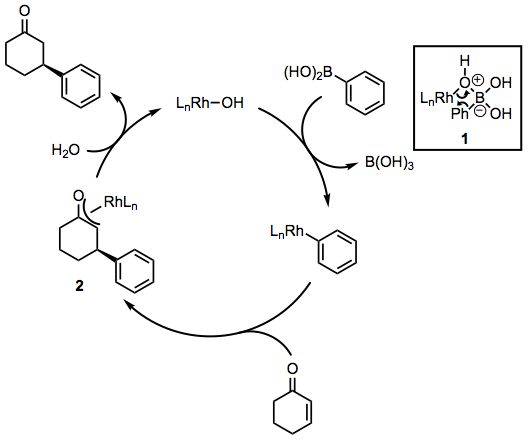 A generally accepted catalytic cycle for rhodium-catalyzed 1,4-additions of organoboron reagents to electron-deficient alkenes is shown in Eq. 2 below. Transmetalation of the organoboron reagent with a rhodium(I) hydroxide (or related) complex is most commonly the turnover-limiting step of the reaction. This step presumably involves intermediate 1 in which boron is coordinated to the hydroxylic oxygen, facilitating transfer of the organic group. Migratory insertion of the alkene into the rhodium–carbon bond affords oxa-π-allylrhodium species 2, a rhodium(I) enolate. Although protonolysis by a protic solvent typically releases the product, domino processes in which the enolate undergoes transmetalation and/or trapping by an added electrophile are also possible. Protonolysis of the organorhodium species, resulting in net protodeboronation of the nucleophile, can compete with migratory insertion of the alkene. To overcome this issue, an excess of the organoboron reagent is often employed. A generalized stereochemical model that can be used to rationalize the observed stereoselectivity of these reactions partitions the space near the alkene and aryl ligands into four quadrants (Eq. 3). Binding of a chiral bidentate ligand to rhodium results in diagonally disposed regions of high and low steric hindrance. The aryl ligand occupies a region of higher steric hindrance and the rhodium–carbon bond participating in insertion is parallel to the alkene. In the favored binding mode of the unsaturated carbonyl compound, its carbonyl group projects into in a region of low steric hindrance. A wide variety of rhodium catalysts containing different classes of chiral ligands are effective in enantioselective 1,4-additions. The earliest examples of this reaction employed chiral bisphosphines such as (R)-BINAP L1, but monodendate phosphorus ligands such as L2 can also be employed. Following the discovery that complexes such as [Rh(cod)Cl]2 and [Rh(cod)2]PF6 are effective catalysts, chiral dienes such as L3 were developed for enantioselective additions. 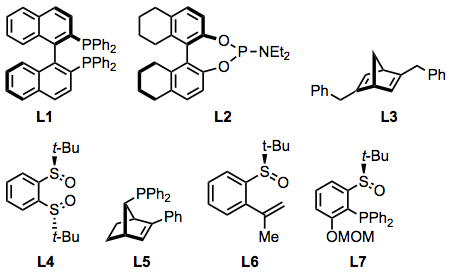 Other classes of bidentate mixed-donor ligands containing phosphorus, sulfur, and alkene donors in various combinations have also been developed (see L4 - L7 below). Boronic acids are the most common class of organoboron reagents employed in rhodium-catalyzed 1,4-additions due to their commercial availability, rapid rate of transmetalation, and stability toward heat, moisture, and oxygen. However, a number of other classes of organoboron reagents can be employed in these reactions (Eq. 5). The following examples demonstrate the general scope of the electron-deficient alkene in these reactions. Unsaturated ketones are the most common substrates, and 2-cyclohexenone is commonly used as a model substrate when testing new chiral ligands (Eq. 6). Although unsaturated aldehydes can be problematic as substrates due to competitive 1,2-addition, methods have been developed for selective 1,4-addition of this class of substrates as well. α,β-Unsaturated esters generally perform well in rhodium-catalyzed conjugate addition reactions. For example, β-(hetero)aryl-substituted esters afford products containing diarylmethine stereocenters after 1,4-arylation (Eq. 7). This structural motif can be found in a number of biologically active pharmaceuticals and natural products. α,β-Unsaturated esters containing amino groups are converted to amino acids after 1,4-addition and hydrolysis of the ester. For example, derivatives of dehydroalanine undergo 1,4-addition in the presence of heteroaryltrifluoroborate salts to afford α-amino acid esters (Eq. 8). Aryltrifluoroborates are also effective nucleophiles in additions to alkenylphosphonates. In the example shown in Eq. 9, which employs the DIFLUORPHOS ligand, the product is a phosphorus analogue of an α-amino acid. Similarly, alkenylsulfones undergo 1,4-addition in the presence of an organoboron reagent and rhodium(I) catalyst (Eq. 10). Alkenes activated by sulfonyl groups other than 2-pyridylsulfones can participate in a competing reaction, cine substitution involving arylrhodation followed by elimination of the sulfonyl group. Alkenylazaarenes contain electron-deficient β-carbons due to the electron-withdrawing effect of the heteroaryl group. These substrates undergo enantioselective 1,4-addition in the presence of arylboronic acids and a rhodium catalyst containing a chiral diene ligand (Eq. 11). Benzenes substituted with electron-withdrawing groups can similarly activate alkenes toward 1,4-addition. For example, in the presence of a chiral diene ligand, an alkenyl-4-nitrobenzene reacts with phenylboronic acid to generate the arylation product in good yield and enantioselectivity (Eq. 12). Carborhodation generates an intermediate that can be envisioned as a rhodium enolate, suggesting the possibility of further nucleophilic reactivity at the α-carbon. Domino reactions involving carborhodation followed by coupling of the α-carbon to an electrophile are desirable insofar as they result in a rapid increase molecular complexity. 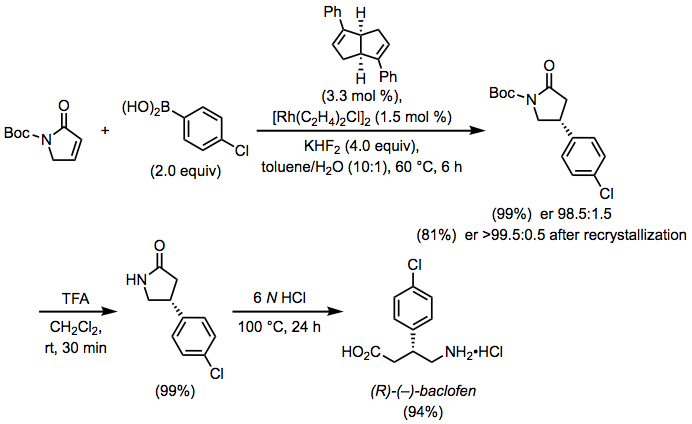 For example, following enantioselective addition of a 9-aryl-9-BBN reagent to 2-cyclohexenone, transmetalation to lithium followed by treatment with allyl bromide affords the product of vicinal difunctionalization in good yield and high enantio- and diastereoselectivity (Eq. 13). Many other types of domino reactions do not require transmetalation before reaction with an electrophile. Enantioselective 1,4-addition of an arylboronic acid to an α,β-unsaturated lactam was applied as a key step in the synthesis of (R)-baclofen, an antispasticity drug (Eq. 14). Alkenylboron reagents have been developed as nucleophilic substrates in these reactions as well. 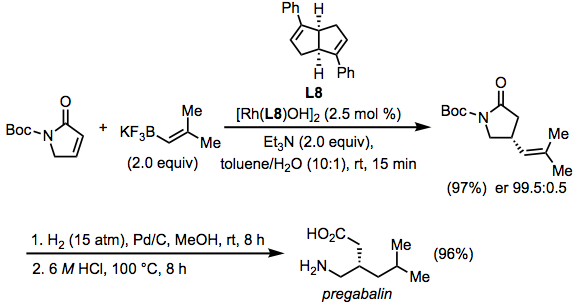 For example, the anticonvulsant drug Lyrica (pregabalin) has been prepared by the enantioselective rhodium-catalyzed addition of a potassium alkenyltrifluoroborate to an unsaturated lactam (Eq. 15). Conjugate additions of arenes or alkenes to electron-deficient alkenes may employ other metals as catalysts or other organometallic nucleophiles. In general, the reactivity of the nucleophile increases with the electropositivity of the bound metal. For example, organoaluminum reagents are considerably more reactive than organoboron reagents toward sterically hindered unsaturated ketones (Eq. 16). Hydrozirconation of terminal alkynes with the Schwartz reagent provides convenient access to alkenylzirconium reagents, which are effective in rhodium-catalyzed 1,4-addition reactions with unsaturated ketones (Eq. 17). Nucleophiles other than aryl-, heteroaryl-, or alkenylmetal reagents often do not react efficiently with electron-deficient alkenes in the presence of rhodium catalysts. For example, β-hydride elimination of alkylrhodium species generally precludes the use of alkylboron reagents in these reactions. However, copper(I)-based complexes can be used to catalyze these reactions as alkylcopper(I) species do not undergo β-hydride elimination (Eq. 18). Copper(I) complexes are thus complementary to rhodium(I) complexes in enantioselective 1,4-addition reactions. Rhodium-catalyzed 1,4-additions of organoboron reagents generally require very few precautions for two reasons: most organoboron reagents exhibit high air and moisture stability and many of these reactions actually employ aqueous base to generate an active rhodium(I) hydroxide catalyst. Ethereal solvents are typically used along with a protic co-solvent that protonates the rhodium enolate generated upon addition. A 20 mL Schlenk flask was flushed with Ar and charged with (R)-MeO-F12-BIPHEP (400 mg, 0.501 mmol), [Rh(C2H4)2Cl]2 (97 mg, 0.25 mmol), and deoxygenated toluene (0.1 mL). The mixture was stirred at rt for 5 min, and then the solvent was removed under vacuum. To the Schlenk flask were added NaHCO3 (6.72 g, 80.0 mmol), phenylboronic acid (36.6 g, 300 mmol), 2-cyclohexen-1-one (19.4 mL, 200 mmol), deoxygenated toluene (30 mL), and deoxygenated H2O (20 mL). The resulting mixture was then stirred at 100 °C for 24 h, and then saturated aqueous NaHCO3 solution was added. The resulting mixture was extracted with EtOAc (3 times). The organic layer was dried over MgSO4, filtered with suction, and then concentrated under vacuum. The residue was purified by silica gel column chromatography (hexane/EtOAc, 5:1) to provide the product (27.9 g, 80%) as a colorless oil: tR (minor) 20.0 min (1%), tR (major) 21.3 min (99%) (Chiralcel OD-H, hexane/i-PrOH, 100:1, 0.7 mL/min); [α]23.5D +19.98 (c 1.0, CHCl3); FTIR (neat) 3061, 3028, 2937, 2866, 1713, 1603, 1497, 1452, 1421, 1344, 1315, 1250, 1223, 1030, 756, 700, and 538 cm–1; 1H NMR (300 MHz, CDCl3) δ 7.36–7.31 (m, 2H), 7.25–7.20 (m, 3H), 3.06–2.96 (m, 1H), 2.63–2.32 (m, 4H), 2.19–2.07 (m, 2H), 1.92–1.74 (m, 2H); 13C NMR (75 MHz, CDCl3) δ 211.0, 144.2, 128.6, 126.6, 126.4, 48.8, 44.6, 41.1, 32.7, 25.4. ↑ Hayashi, T.; Takahashi, M.; Takaya, Y.; Ogasawara, M. J. Am. Chem. Soc. 2002, 124, 5052. ↑ Kina, A.; Iwamura, H.; Hayashi, T. J. Am. Chem. Soc. 2006, 128, 3904. ↑ Berthon, G.; Hayashi, T. In Catalytic Asymmetric Conjugate Reactions; Córdova, A., Ed. ; Wiley: Weinheim, 2010; pp 1–70. ↑ a b Sakai, M.; Hayashi, H.; Miyaura, N. Organometallics 1997, 16, 4229. ↑ Itooka, R.; Iguchi, Y.; Miyaura, N. J. Org. Chem. 2003, 68, 6000. ↑ Paquin, J.-F.; Stephenson, C. R. J.; Defieber, C.; Carreira, E. M. Org. Lett. 2005, 7, 3821. ↑ Navarre, L.; Darses, S.; Genet, J. P. Angew. Chem., Int. Ed. 2004, 43, 719. ↑ Lefevre, N.; Brayer, J.-L.; Folléas, B.; Darses, S. Org. Lett. 2013, 15, 4274. ↑ Mauleon, P.; Alonso, I.; Rivero, M. R.; Carretero, J. C. J. Org. Chem. 2007, 72, 9924. ↑ Yoshida, K.; Hayashi, T. J. Am. Chem. Soc. 2003, 125, 2872. ↑ Pattison, G.; Piraux, G.; Lam, H. W. J. Am. Chem. Soc. 2010, 132, 14373. ↑ Saxena, A.; Lam, H. W. Chem. Sci. 2011, 2, 2326. ↑ Yoshida, K.; Ogasawara, M.; Hayashi, T. J. Org. Chem. 2003, 68, 1901. ↑ Meyer, O.; Becht, J. M.; Helmchen, G. Synlett 2003, 1539. ↑ Yu, H.-J. ; Shao, C.; Cui, Z.; Feng, C.-G.; Lin, G.-Q. Chem.—Eur. J. 2012, 18, 13274. ↑ Hawner, C.; Müller, D.; Gremaud, L.; Felouat, A.; Woodward, S.; Alexakis, A. Angew. Chem., Int. Ed. 2010, 49, 7769. ↑ Oi, S.; Sato, T.; Inoue, Y. Tetrahedron Lett. 2004, 45, 5051. ↑ Yoshida, M.; Ohmiya, H.; Sawamura, M. J. Am. Chem. Soc. 2012, 134, 11896. ↑ Korenaga, T.; Maenishi, R.; Hayashi, K.; Sakai, T. Adv. Synth. Catal. 2010, 352, 3247.